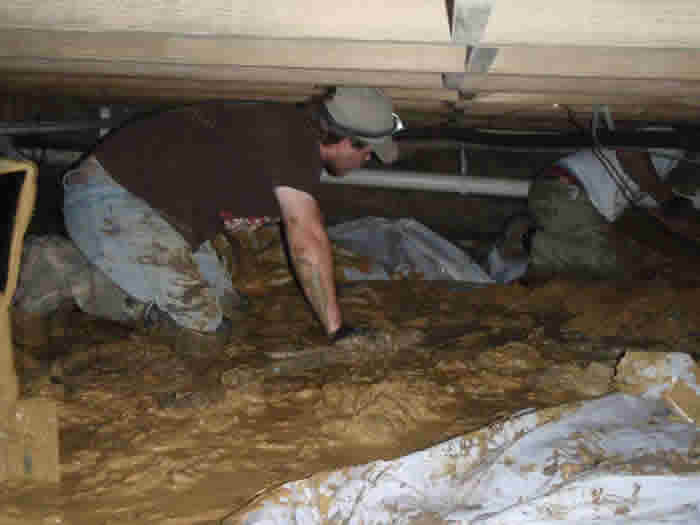 John Davis in his home’s crawl space. “I have no doubt we did the right thing” said John P. Davis. Davis, who retired in Talbot County, had just finished improving the insulation in his crawl space, attic, and walls with the support of a $2,800 grant from the Maryland Energy Administration (MEA). For him, the investment was about a better retirement. Davis is not alone. The program that provided the grant — Maryland’s Home Performance Rebate program — was funded by the American Recovery and Reinvestment Act, and as of July, 2011 it had helped more than 850 Marylanders make energy-saving upgrades to their homes. Davis consulted with a few of those homeowners during his search for a contractor, ultimately choosing Total Home Performance, a two-year-old small business less than a half mile from his home. Hargrove says many of these new hires were fisherman, who he praised for being exceptionally capable workers due to the wide variety of skills needed to maintain a boat. Now these fishermen are “weatherization technicians,” and Hargrove wants to make sure he retains them. “We hope everyone we hire can run their own crew in six to eight months” Hargrove said. As for Davis, he has been tracking his energy bills for the last few years, and is interested in comparing them from season to season. The savings he notices will likely be as comforting as his new crawl space. The Home Performance Rebate program offers homeowners bigger rebates than ever for home energy efficiency improvements. As of July, 2011, this program had helped homeowners save more than $3 million, and reduced the State’s greenhouse gas emissions at a measure equivalent to taking 140 cars off the road.